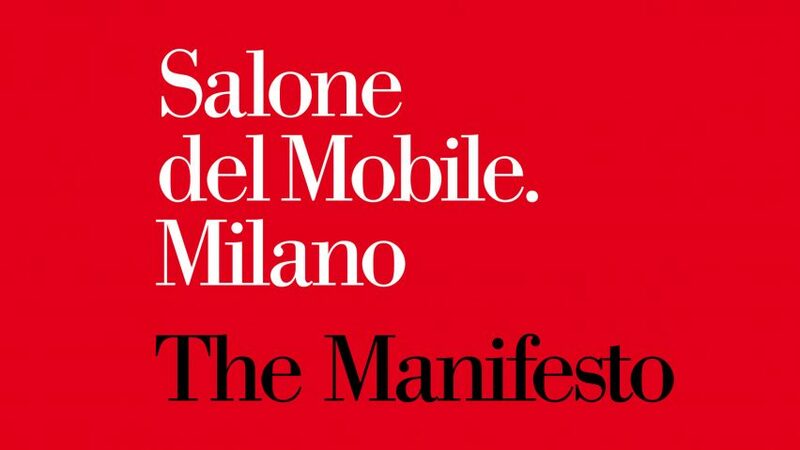 Salone del Mobile launches manifesto calling on Milan to "up its game"
Milan's annual furniture fair, the Salone del Mobile, has published a manifesto calling for the city and the design industry to promote innovation and sustainability at this year's event. The Manifesto, released ahead of the fair's 2018 edition, describes itself as "a declaration of intent geared to channelling the forces in Milan to work together to preserve the leadership role of both the city and the trade fair". It calls for architects, designers and brands to pay attention to the circular economy, respect Milan's architectural development, encourage sharing of ideas, and champion the work of young designers. "We now need to up our game to overcome the global challenge," said Salone del Mobile president Claudio Luti, speaking at a press conference to launch the manifesto. "The Salone del Mobile now needs to keep evolving and consolidating its links with Milan." "The first manifesto is a commitment to keep striving to do better, and is an invitation to Milan to keep networking, building on the centripetal and attractive power of the Salone and consolidating the city's role as 'the place to be' for leading brands, their projects and their human and financial resources," he said. Taking place in April each year, the Salone del Mobile sees more than 300,000 visitors descend upon the Italian city to attend the trade show and its associated satellite events, known as the Fuorisalone. Now in its 57th year, the trade show underpins what is widely regarded as the design industry's most important design week. But the event has faced some criticism in recent years, over both its organisation and its content. In 2013, Dezeen editor-in-chief Marcus Fairs complained about the lack of coordination for events outside the main trade fair – triggering a response from Luti, including a promise to overhaul the way the fair operates. New Salone del Mobile president to tackle issues that "damage Milan"
Two years later, just before the 2015 fair, designer Hella Jongerius and theorist Louise Schouwenberg launched their own manifesto, calling for the design industry to abandon its "obsession with the new for the sake of the new". And the same year, critic Alice Rawsthorn complained about how the fair had become a celebration of marketing over design. The Salone del Mobile's new manifesto targets these issues and more, with its rallying cry for the industry to "give shape to the sort of design and architecture that is more conscious of the needs of a constantly evolving society"
It also encourages companies, architects and designers participating in the fair to challenge production processes and service methods in order to "stay ahead of the game". Under the headings of Quality and Enterprise, the manifesto calls for exhibitors to have a greater awareness of the impact of their products on the environment and urges exhibitors to embrace the circular economy. "The phrase we've always done it like this has ceased to exist, replaced by a commitment to strive to do even better and achieve more than we already are," it reads. A section titled Design addresses architects and designers in Milan directly, stating: "Let us continue to help Milan grow with fine new futuristic architecture as well as with conversions of old buildings, let us think in terms of a joint effort to create the model of a city that is increasingly beautiful and welcoming, not just during the Salone del Mobile." Calls for greater cultural and spatial inclusion come under the heading of Networking, where the document highlights the importance of "sharing ideas, needs, experiences, sharing real contacts, networking in order to grow together". Milan's museums offer "treasure trove to be discovered"
The importance of the fair's 21-year-old Salone Satellite event, which champions young designers, is also underscored in the manifesto. The text also promotes digital media. "The aim is to harness these new tools to create opportunities for development," it says, as a means to break down "barriers and frontiers". The city's cultural institutions and museums are also celebrated, as "a treasure trove to be discovered and rediscovered". It hints at plans to transform the city's Triennale museum into "a dedicated space for design and architecture". In the manifesto's final section, titled Milan at the Centre, it states that the Salone should serve as "a possible model for the rehabilitation" of the Milan Expo 2015 site, which is currently being redeveloped by Carlo Ratti Associati. This ties in with an exhibition that Carlo Ratti Associati and Studio Römer will put on at the fair this year, titled Living Nature. Held as part of the Salone's exhibitions and events programme, the showcase will be held in front of Palazzo Reale in the Piazza del Duomo. It will explore the relationship between nature and humans, discussing ideas about sustainable design both inside and outside the home. The launch of the manifesto comes shortly after Dezeen launched its own initiative promoting the potential for design to create positive change. Good Design for a Bad World questioned whether designers can offer solutions to global issues, in a series of panel discussions at Dutch Design Week (DDW) in October last year. As DDW's first international ambassador, Dezeen founder Marcus Fairs initiated the project as his contribution to the design week. "For a long time I've wanted to draw attention to the ways that designers today are tackling major issues facing the world," said Fairs at the time. "Good Design for a Bad World will hopefully shine a spotlight on great work in this area and encourage others to follow suit."